Government Procurement is a specific built-in agenda in the Revised Treaty of Chaguaramas (RTC) including the CARICOM Single Market and Economy (CSME). In Article 239 of the RTC – “Undertaking – provides that “Member States undertake to elaborate a Protocol relating, inter alia, to government procurement”. The World Trade Organization (WTO)  Plurilateral Agreement on Public Procurement applies only to those members who choose to sign onto it, but no Caribbean Community (CARICOM) Member State has signed so far. However, the WTO is now encouraging developing countries to sign. The current CARICOM position is to develop a regional regime only and to avoid commitments at the multilateral level. In pursuing this Treaty commitment, the CARICOM Secretariat has taken the lead role with the establishment of a Task Force on Public Procurement comprised of Senior Finance and Trade Officials. In 2005, the First Draft of the Community Policy on Public Procurement was developed and disseminated to Member States for review. The Secretariat secured funding under the 10th European Development Fund (EDF) to finance meetings of the Task Force to conduct related studies, procure computers and other electronic equipment which were distributed to Member States in 2017. Belize is jointly represented on the Task Force by the Ministry of Finance and the Ministry of Investment, Trade and Commerce. 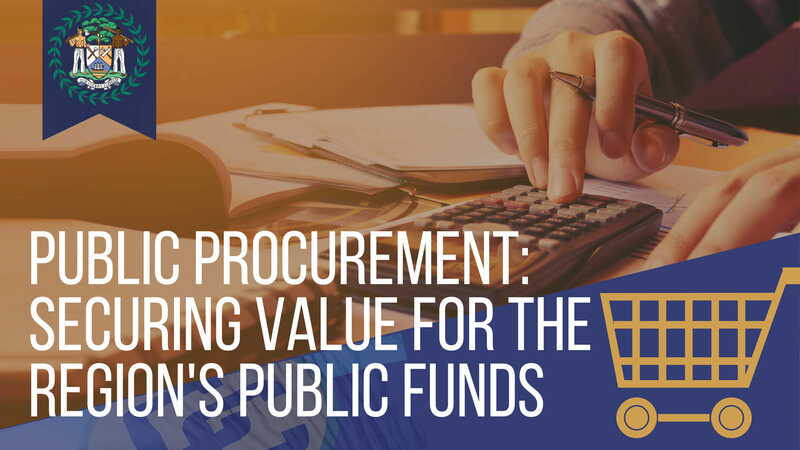 In 2018, a final draft Protocol on Public Procurement was developed and submitted to the Council on Trade and Economic Development (COTED) for its review and approval. The 74th Special Meeting of the COTED convened ion 14th June, 2018 to consider the draft Protocol which was endorsed for presentation and final approval at the Thirty-Ninth Meeting of the Conference of Heads of Government held in Jamaica from 4th– 5th July, 2018. The COTED also mandated that the Legal Affairs Committee (LAC) complete the legal review of the document before its presentation to the Heads of Government. Belize endorsed this course of action by the COTED. The provisions of the Protocol are very comprehensive in content and scope of application. It is divided into nine parts with a total of 41 Articles. Part One establishes the use of terms under the Protocol, the objectives of the regime, its operating principles and implementation requirements including legislation, institutional arrangements and prohibition of restrictions. Part Two establishes the scope and coverage of the Protocol, including: its scope of application; provisions for review of the thresholds; the contracts valuation rules; the rules of origin (applicable to goods procured); and for the prohibition of offsets. Part Three treats with information and communication technologies to be employed, including communication modalities, and for Community information systems comprising traditional and electronic media. Part Four establishes the procurement proceedings, which include the following: the Community standard bidding documents; annual procurement plans; publication of procurement opportunities; procurement methods; time limits; submission, receipt and opening of bids; evaluation of bids and notice of successful bids; publication of notice of contract award; record of procurement proceedings; contract administration; and statistical reporting. Part Five provides for transparency, fairness and supplier challenge, featuring the following elements: technical specifications; qualification and eligibility of suppliers; limitation on disclosure of information; anti-corruption and conflicts of interest; norms and standards; and supplier challenge and review. Part Six pertains to technical cooperation and assistance targeting participation of disadvantaged countries, regions and sectors in the regime along with the mode, scope and extent of same. Part Seven provides for institutional arrangements at the regional and national levels, including: establishment of the Permanent Joint Council on Public Procurement; the Community Public Procurement Notice Board; and the Community and National Suppliers Register. Part Eight deals with the special provisions of the Protocol, covering: dispute settlement; public procurement and the environment; general and security exceptions; signature and provisional application; ratification and entry into force; amendments, reservations and accession to the regime. A combination of goods and services: USD $150,000. Goods and services relating to privately funded charities. The Ministry of Finance is the competent authority responsible for public procurement and officials have already received training on the establishment and use of a National Portal. Computers and other equipment have been distributed regionally including Belize for the national portal to be linked to the regional Notice Board. The Directorate General for Foreign Trade and the Ministry of Finance has met with Economic Development Council, and the Belize Chamber of Commerce and Industry (BCCI) to discuss the regional Draft Protocol on procurement and established clarity on the Procurement regime. Also discussed at the Thirty-Ninth Meeting of the Conference of the Heads of Government in Montego Bay, Jamaica were two outstanding matters: (i) the revision of the thresholds and (ii) the way the protocol may be provisionally applied. Member States were encouraged to use the Community Public Procurement Notice Board and the National Advertising Portals. Belize intends to sign unto the Procurement Protocol. The Government of Belize continues to engage with the private and public sector to secure buy-in for a viable regional procurement protocol. World Trade Organization (WTO) has many roles: It operates a global system of trade rules, acts as a forum for negotiating trade agreements, settles trade disputes between its members and supports the needs of developing countries. COTED is one of the four organs that supports the functions of the principal organs of the Community: The Conference of Heads of Government and the Community Council of Ministers.